Value investing is one of the old and best methods of stocks picking. Today we will learn about the concept of value investing in stock market. Value investing in the stock market means finding companies that are trading below its intrinsic value. Investors of these companies are known as a value investor. The value investors always look for strong companies with good fundamentals. Becoming value investor means finding companies that seem to be undervalued by the market and contains good potential upside. Value investor needs to do sufficient homework for picking value stock. It is an extremely difficult task. It is not like e-commerce site announcing the online sale and offering a discount. It is like finding the stock which is available on discounted price. How to Pick Value Stock? In order to find value stock first evaluate following fundamental values of stock. A price to earning ratio compares company’s current share price and its earnings. Price to earning ratio (P/E) gives a quick snapshot of company finance. It indicates that how much an investor is paying for company’s growth (profit). 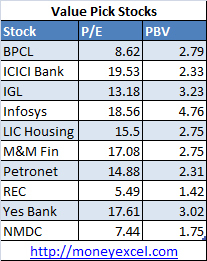 You should compare P/E ratio of one stock with other equivalent stock in the same sector. Lower the P/E ratio means better the stock for investors, as there are chances of higher appreciation. The higher P/E ratio means you are paying more for the stock. Return on Equity (ROE) is important ratio it indicates profit a company is earning as a percentage of total equity. It is useful in comparing the profitability of company over a period of time. You should average out ROE for past 5-10 years to get better understanding of historical growth. ROE value should be higher. Price to Book value (P/B ratio) compare share price to book value. P/B ratio indicates how much investors are willing to pay for each rupee of company’s asset. Company’s asset means physical tangible assets it does not take in account other intangible assets. Debt to Equity ratio is the financial ratio that indicates what portion of the debt and equity is used in order to finance the business of the company. This ratio is calculated by dividing total liabilities of the company by equity invested by the investor. A high debt to equity ratio may cause hindrance in company’s growth as more liability means company need to pay more interest. The Price Earning Growth Ratio is known as PEG ratio. PEG ratio takes in to account company earning and growth. PEG ratio gives an indication about company growth and earning. 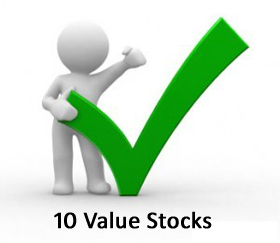 Considering all above factors in mind following, 10 most valued fundamental stock pick is recommended by the analyst. Don’t forget to share this stock recommendation on facebook and twitter!